“Unachievable.” That's what fiscal watchdog group The Civic Federation calls Gov. 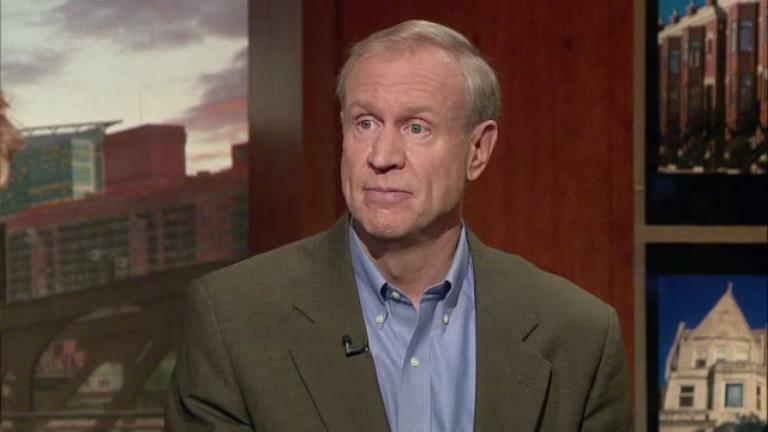 Bruce Rauner's proposed 2016 fiscal budget in a new report released today. And the report comes a day after Rauner gave an unprecedented speech to the Chicago City Council, saying city officials shouldn't expect a bail out from the state. Tonight we talk with a panel of experts about what this means for the city and the state. Joining us are Laurence Msall, president of The Civic Federation; Anders Lindall, spokesman for AFSCME Council 31; Ted Dabrowski, vice president of policy for the Illinois Policy Institute; and Michael Belsky, professor at the University of Chicago’s Harris School of Public Policy. View a chart of Civic Federation positions on Gov. Rauner's budget proposal. The proposal relies heavily on projected savings. Publishing the plan on the deadline of Feb. 18, 2015 gives legislators time to evaluate the plan before the start of FY2016 on July 1. The budgets of fiscal years 2010, 2011, 2013, 2014, and 2015 were all delayed. Many municipalities are facing severe financial strain. If the finances of local governments—particularly Chicago’s, the state’s economic engine—deteriorate further, the state will also suffer. Because borrowed amounts must be repaid within 18 months, borrowing adds stress to future budgets. Pension reform is unlikely to be implemented in FY2016. If the savings are included in the budget but not actually achieved, the state’s fiscal condition would worsen. The state begins each year in a hole because of the backlog, which is expected to total $6 billion at the end of FY2015. The state’s low credit ratings are also due to these unpaid bills. The Civic Federation recommends paying all the bills within the next five years. The reduction is unlikely to be implemented in FY2016 due to the sheer amount of time and effort involved in labor negotiations with unions. While the Civic Federation opposes accounting for savings in the budget, it supports efforts to seek those savings. These savings are unlikely to be achieved because they require changes in state law and approval from the federal government and/or courts. In FY2015, $452 million was diverted into two funds—one for education and one for human services. These would have more than doubled in FY2016. Eliminating the diversions makes the budget process more transparent and easier to distribute resources. Services like keeping seniors out of nursing homes, assisting people with severe disabilities, and treating those with mental illnesses are more efficient in the long run that institutionalization.